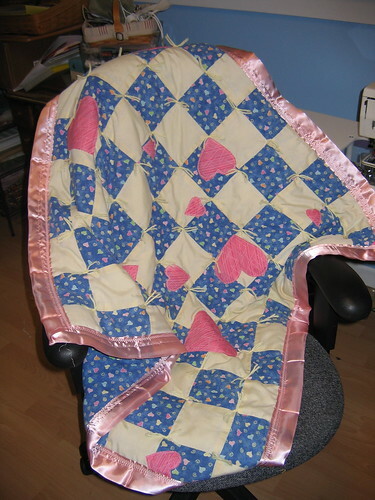 Here is the little quilt I salvaged for my friend's little girl. I guess when she was about 6 months old she was hospitalized in a small town while on vacation. The hospital gave her this little quilt and it has been well loved over the last 6 or so years. Her grandma made some repairs but it was looking pretty sad again when I got it. It was just sewn around the outside edge with no ties so it was pretty easy to take apart. I added some new corners where they were needed and appliqued pink hearts over 'owies' and stains. I used a fluffy polyester batting that I had on hand and tied it with some yellow yarn I also had on hand. For some reason the back was actually smaller than the front but since I was adding satin binding (again something I had on hand) that didn't matter. I hope Miss Elisabeth is happy with how it turned out.